We’re going to jump ahead in sequence of our Creating a Cover series, and we’re combining it with the next installment of Character Designs. 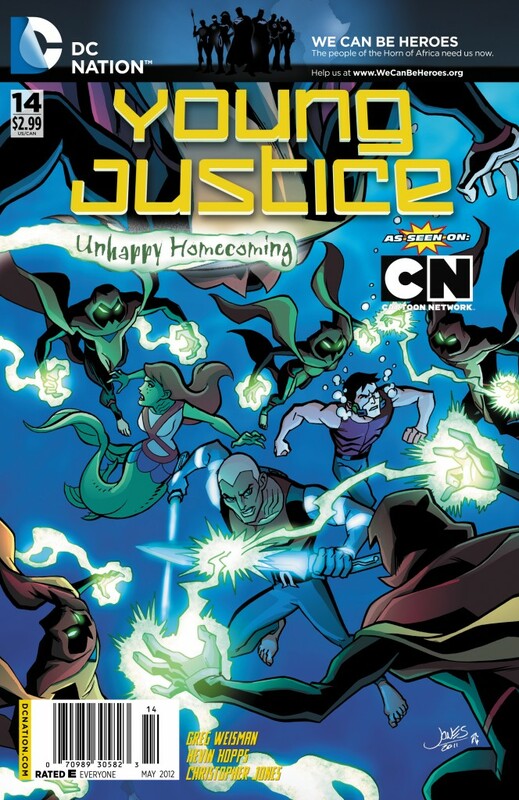 That’s because most of what there is to tell about this cover is about the desgin work that needed to be done for it, and there are SO MANY new characters appearing in Young Justice #14 that I thought I’d get a few of them out of the way with this entry before detailing the rest of them in a separate entry on YJ #14 in the near future. Long before I drew the issue itself and even before I’d seen a final script for the story, I needed to design the cover for the issue, needed early for publicity and solicitation purposes. 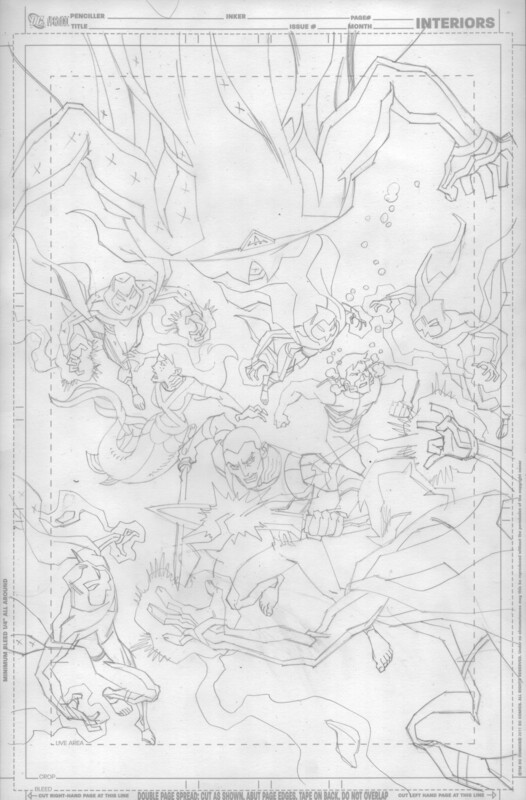 The scenario I was given was to do an underwater downshot of Aqualad, Miss Martian and Superboy surrounded by Hooded Atlantean Purists. Furthermore, Superboy was to be wearing one of Aqualad’s spare costumes, but MINUS the Water-Bearers, BackPack and “A” belt buckle. He was also to be sporting a clear oxygen mask that covers his mouth and nose with some form of filter/re-breather attachment. Miss Martian was to have shape-shifted into a more underwater-friendly form, having ditched her usual cape and morphed herself to copy Lori Lemaris’s mermaid tail from the waist down and having grown Aqualad-like gills on her neck. She was also meant to be shorter than usual, but that didn’t end up being a big issue with the floating figures on the cover. 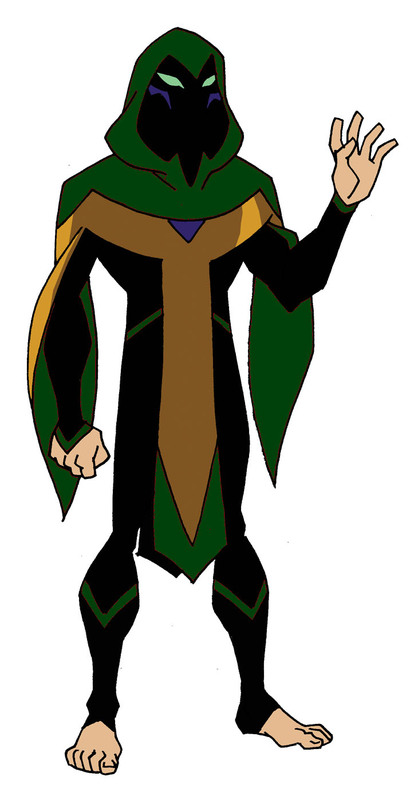 The Purists were meant to be cloaked and hooded Atlanteans of Aquaman’s type, i.e. to the naked eye they look completely human. Like all Atlanteans, there were to have bare feet. I was also instructed that their eyes were to magically glow from within the shadowed depths of their hoods. 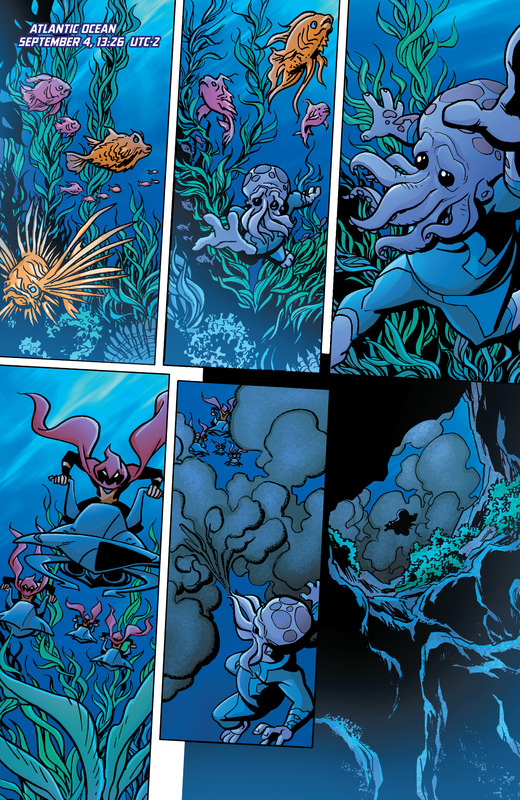 Miss Martian’s mermaid form was almost a non-issue, as it was just putting the top of her body on the bottom of the design for Lori Lemaris, plus adding gills identical in design to Aqualad. Superboy was basically in Aqualad’s costume minus key accessories, plus the addition of an oxygen maks. And I had to design the Purists. I wanted to give the Purists interesting looking hoods, as I figured we’d be getting a lot of shots of these hoods serving as close-ups of characters in the actual story. I also wanted lots of draping fabric that could swirl in the water and make interesting shapes and suggest movement. The draping sleeves and tabards tended to get even more elongated once I was actually drawing the story. The whole design evolved a little bit once I started drawing pages, but we stayed close enough to the approved model that no one complained! I wasn’t sure about a color scheme, so I put these three options together, half-expecting to have someone suggest an option D. Version B was chosen, but which do YOU prefer? 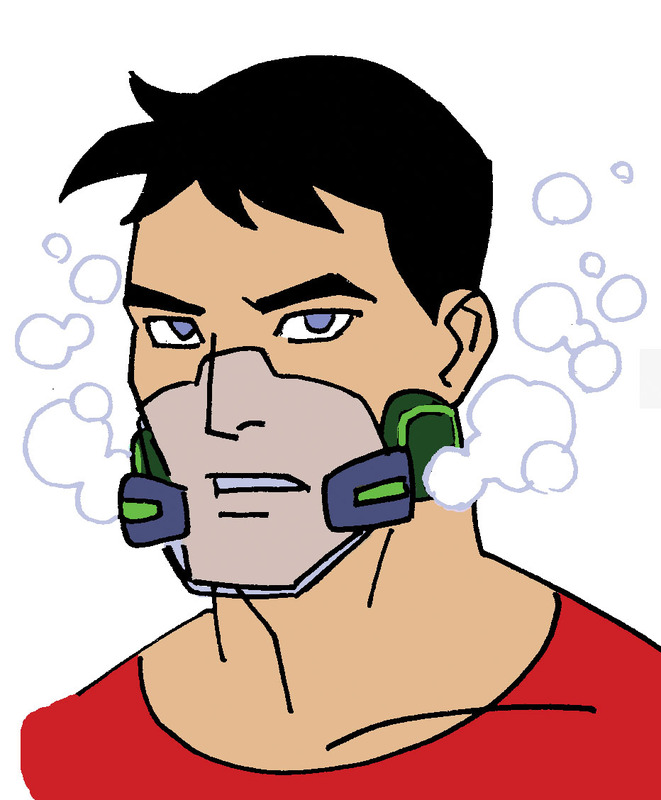 Next up was Superboy’s air mask. I wanted to keep this simple and unobtrusive. I wanted Superboy’s face and expressions to be unobscured, and I figured we were dealing with advanced Atlantean technology and we didn’t need to be constrained by anything resembling current diving gear and oxygen tanks. This is what I came up with, and it actually became further simplified in the story, losing those square-ish bits at the corners of his jaw. So now it was time to design a cover! This was a relatively tight drawing for a cover rough, but we seemed to be pretty firmly locked into a concept, so I felt I could do something fairly tight I could then use as a basis for the final pencil art. Given that the characters were floating in water, I wanted the heroes to be “surrounded” in a fairly 3-dimensional way. I tried to make it clear that the Purists were not only coming from all sides but also from above and below. The feedback was that DC wanted a little more of a feeling of action. Also, they wanted the piece to have a little more focus, so it was suggested to emphasize Aqualad a little more since it was his story. 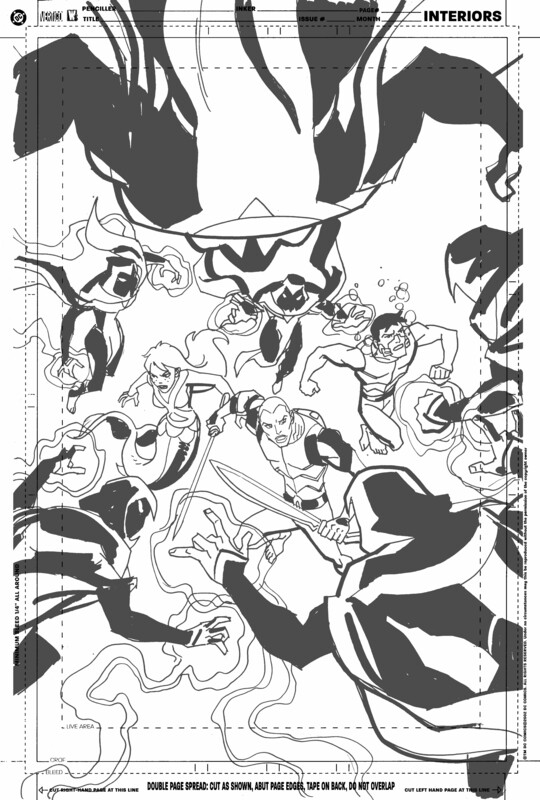 The revised version is pretty similar – I just changed the proportion of some of the characters, bringing Aqualad forward and pushing Superboy and Miss Martian back. I turned Miss Martian’s head to better show off the gills on her neck. 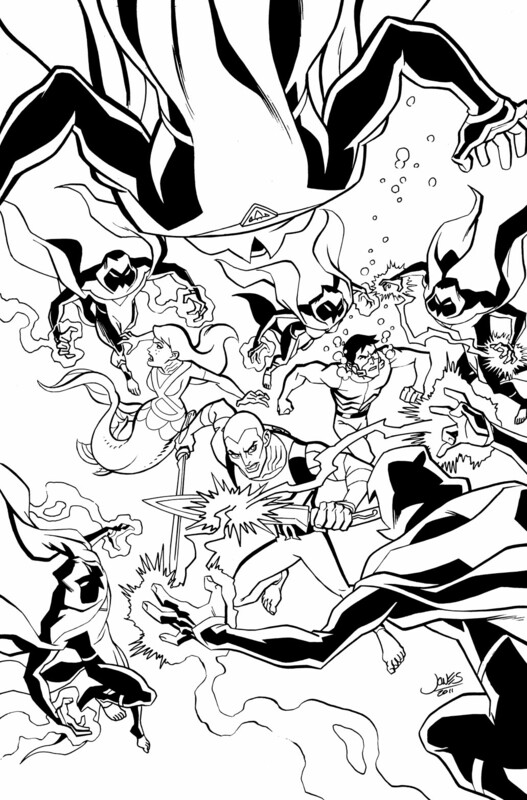 Aqualad is now deflecting a magical attack from one of the Purists with one of his hard water blades. This version was approved, so from there it was the routine progression of pencils and inks, with color by Zac Atkinson. And there you have it! Young Justice #14 goes on sale TODAY both in digital form or at your local comic shop! Young Justice | Christopher Jones | 6:04 am | Comments Off on Young Justice #14 out today! Young Justice #14 Solicit is Out! 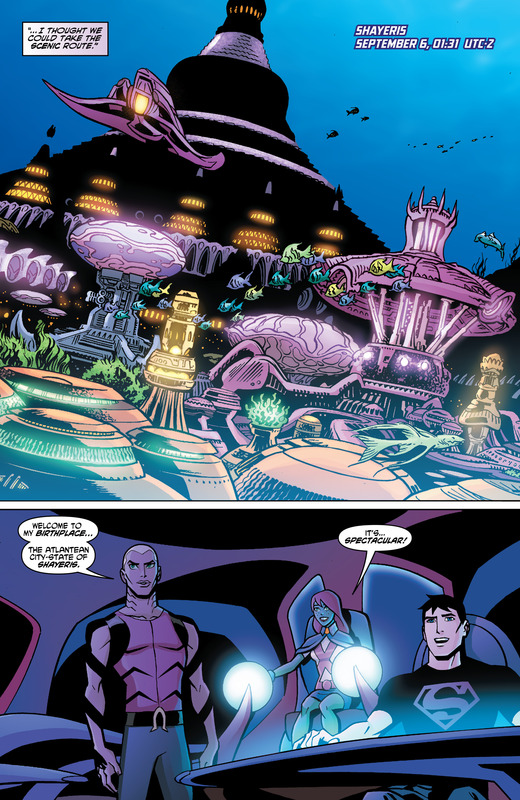 Aqualad visits Atlantis with Superboy and Miss Martian. But can they stop an insidious new menace that threatens to plunge the undersea kingdom into civil war? 32 pages, $2.99, in stores on March 21. 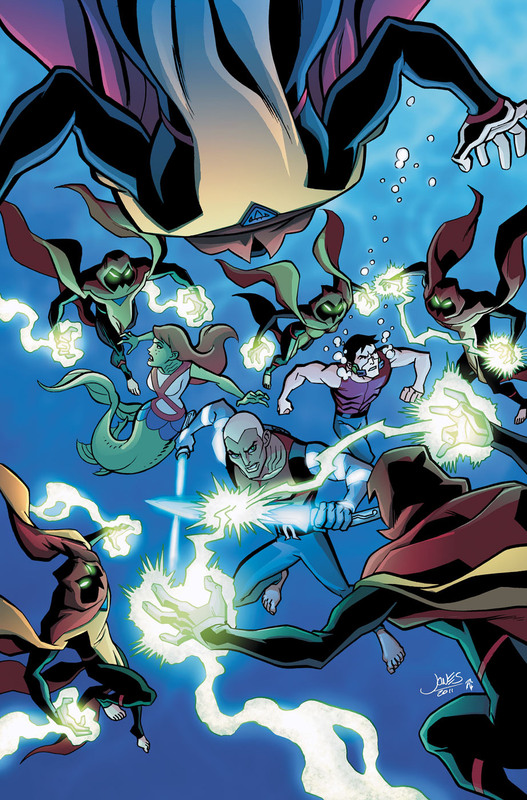 And yes, that’s Miss Martian with gills and a mermaid tail, and Superboy wearing a spare Aqualad costume. And who are the mysterious cloaked figures threatening our heroes? You’ll have to read Young Justice #14 to find out! Issues #1-10 are currently available and issue #11 featuring Batman and Ra’s al Ghul will be out soon. Pick an issue up in digital form or at your local comic shop! 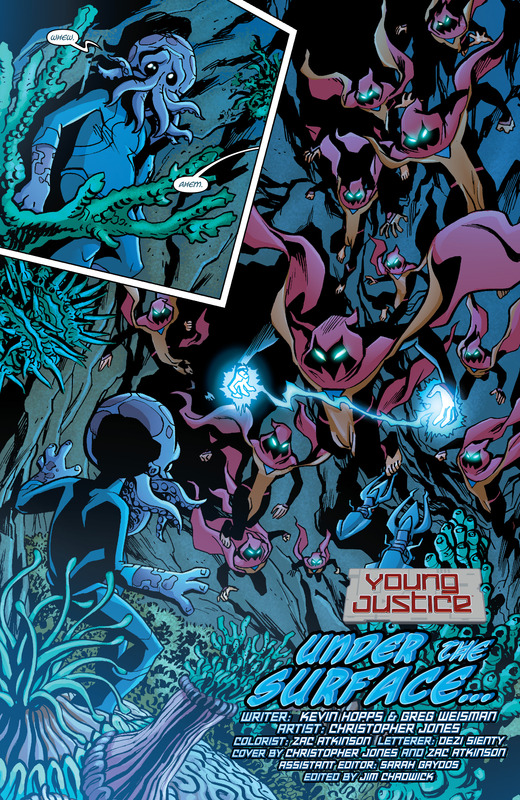 Young Justice | Christopher Jones | December 14, 2011 11:41 am | Comments Off on Young Justice #14 Solicit is Out! Young Justice #13 solicit is out! art and cover by Christopher Jones. In Star City, Artemis is under arrest — and in Gotham City, it’s Clayface vs. the rest of the team in a battle they cannot win! 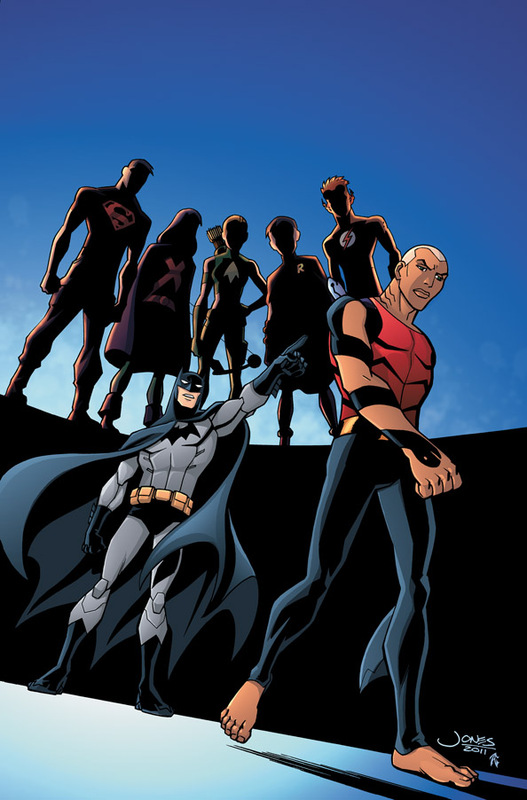 Aqualad’s leadership is on the line, and a fateful choice must be made. 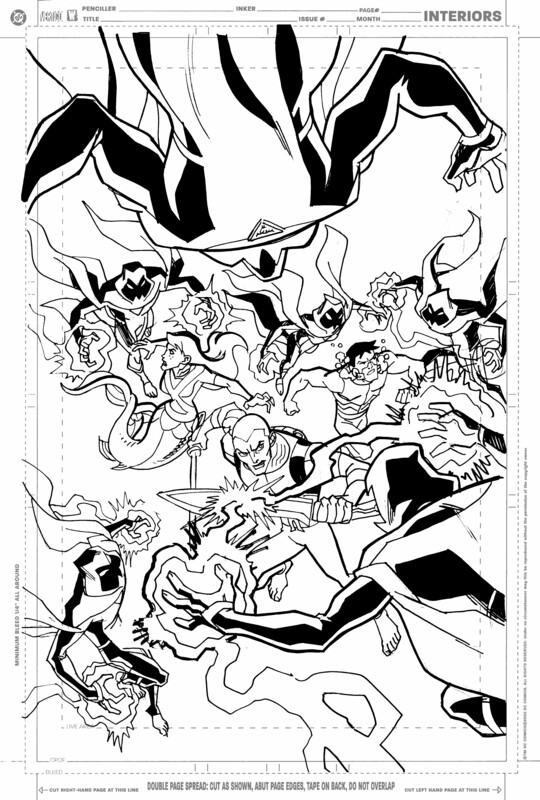 Young Justice | Christopher Jones | November 14, 2011 5:29 pm | Comments Off on Young Justice #13 solicit is out!